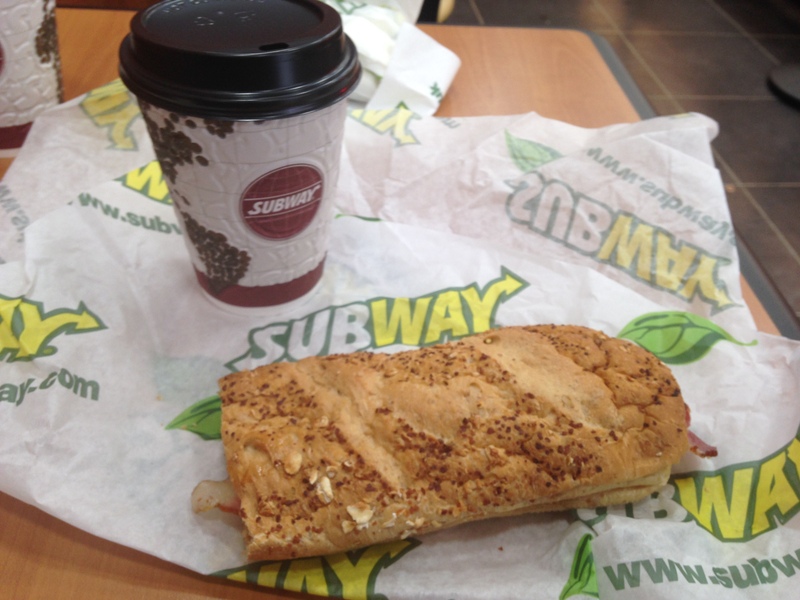 Seduced by the Price is Right offer of a Sub and a coffee for £2.00, this morrow we tried a Subway breakfast. As connoisseurs of bacon butties, as is abundantly clear, we opted for just bacon ensconced in a 9-grain honey oat bread. The ambiance of the place fluctuated between deafening silence and dreadful music. Other than ourselves there was a nefarious teenager using the wifi. Our lattes differentiated in temperature so much that we thought we must have inadvertently ordered one iced coffee. The taste was not too dreadful, nowhere near as traumatic as our dishwater lattes from Percy Ingles. But, on our scale of 1 to Waitrose we give it a mere 6. The bacon was so bland and lifeless, not salty or crispy is the least. We felt sure we must have been in one of the UK’s 185 halal Subway stores, ergo be indulging in turkey bacon. But, oddly, we were not. The experience of ordering is onerous in Subway, especially early in the morning, and would be far too convoluted if one were hungover. We see no earthly reason to return to Subway for breakfast. It was what we expected, but somehow we had hoped for a miraculous surprise. Yes, the price was right, but everything else was wrong.